This celebratory event will showcase Somability, an accessible software application, created by designers from Cardiff Metropolitan University and Cariad Interactive in partnership with Rhondda Cynon Taf Skills for Independence day care service and Artis Community. The project uses game technologies to capture movement and generate beautiful, graphic imagery. A compelling preview of Somability will be performed by adults with profound and multiple disabilities and their support workers on the Glanfa Stage. This will be followed by an explanation of the project, panel discussion and an opportunity for the audience to join in and explore the software. There will opportunity to see other recent work being undertaken at CARIAD, to meet participants, researchers, organisations, charities and businesses improving people’s lives through the arts. The event will be open to the public and in a public space. Delighted to announce that Leah has been successful in her latest funding bid to work with special need teachers from Exeter House School and AnalysisPro! ProEngagementCoding will be developing new work and templates from our first collaboration with the project ProFoundCoding. The group will be seeking to extend their reach by designing a series of templates and to begin evaluations of the templates in action, a call for some volunteers will be going out soon! Leah had a hugely informative day attending NESTSA’s latest event, ‘People Helping People: The Future of Public Services’ in collaboration with NESTA and the Cabinet’s Office Centre for Social Action. This is part of the UK wide new agenda to connect organisations doing social good with public services and government. Goeff Mulgan, Chief Executive of NESTA led a packed schedule of talks, workshops and networking. A key note speech from Rt. Hon. Brooks Newmark MP, Minister for Civil Society marked his first public speech since taking his newly appointed role, nice to meet you! We met with some of the most exciting innovators working in the UK and overseas who are committed to their organisations making contributions to society. Leah had some very interested conversations with CodeClub, Spice, Shared Lives Plus, FutureGov, and The Thought collective (all the way from Singapore!) amongst many more. CARIAD are committed to designing new innovations which have a positive impact on society. The Breaking Bread project will be following these initiatives closely as the project begins to scale up and work with volunteers in the community, we are excited to extend our reach to work across public services and government in Wales. Maybe even next year CARIAD will be one of the exciting new innovators. Leah met up with Luke from Cardiff Voluntary Services Cardiff this week when he asked her to appear on their volunteering broadcast to talk about her latest project Breaking Bread. She talked about recent innovations with CARIAD and new plans to extend her recent successful workshops. Leah has received some extended funding from Cardiff Met Alumni and development fund in the interim and the Breaking Bread team are exploring new opportunities. Watch this space! We shared our air time with @BulliesOut an award winning Charity providing help and support to people and organisations affected by bullying. 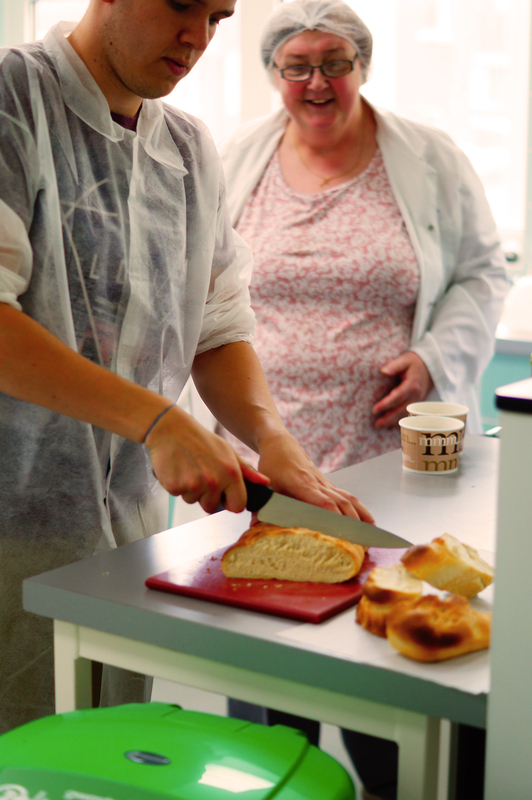 First trial workshops of Breaking Bread hosted at Cardiff Met are a massive success! Thank you thank you, to ALL of our Breaking Bread participants who fought through the heat to attend our first trail workshop of our brand new service, Breaking Bread! Marion, Leslie, Jane, Liz, Gerri and Lyn teamed up with Daniel, Steve, Gareth, Helena, Ilid and Deirdre and made some delicious bread and pea and mint soup for lunch. A big shout also goes to Rhys (master baker) for hosting the session and Ray and his team at Food Technology, we couldn’t have put it together without you!